Adopted by the railroad men, the pooch eventually was run down by the 5:15. His headstone has been moved to the parking lot of the museum. 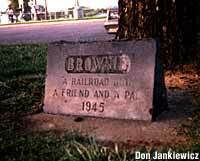 Brownie's headstone is in the parking lot of the Route 66 museum, against the wall of the building. If you don't look, a car can block the view if they park in front of the headstone. The park where Brownie was originally buried is now the trolley/train parking lot and station. The park where Brownie's headstone is located has been fenced off and has been sold for some sort of development. We confirmed that Brownie's headstone has been moved across the street to the Route 66 Museum. The museum is between the park and the I-15 freeway, in the next block down from the park. Brownie's headstone has been moved....but what about Brownie? Please exercise caution in Forrest Park. It is rapidly becoming a very bad area, and if you want to stop and see the grave, beware of your surroundings and keep an eye on your fellow "park users" at all times. I would not advise going alone, or wearing anything that looks flashy or expensive (including your camera). There have been a lot of altercations and disturbances there lately. I was in Victorville, getting film to take pictures of the absolutely tasteless Roy Rogers gravesite, Apple Valley, CA, when I stumbled across another, unheralded gravesite, next to the public restroom at the Victorville Amtrak stop, of Brownie The Railroad Dog. They had a xeroxed write-up by a local columnist in the '60s explaining dear Brownie's life -- much more compelling than that showbiz snob, Trigger, down the road. Anyway, after a near-tragedy when an automobile hit him (the irony!) the nearby AT&SF station manager took stray dog Brownie in and nursed him back to health, where the railroad men adopted Brownie and vice versa. Dog faithfully met every Santa Fe train's crew coming up from the treacherous El Cajon summit, and they threw him meat cooked on the caboose stove. Wouldn't allow passengers dogs in "his" station until eventually poor pooch was ironically run down by his beloved 5:15. California Route 66 Museum - Hulaville Model, Victorville, CA - < 1 mi. Grave of O.K. Corral's Morgan Earp, Colton, CA - 32 mi.